Lapu-Lapu City is one of the 3 cities comprising METRO CEBU. An independent component city, it is composed of 30 barangays with 19 located in mainland Mactan island and 8 barangays at Olango Island and the 3 barangay islets of Caubian, Pangan-an, and Caohagan. Total land area of the city is approximately 6,422 hectares of which 5,400 ha. is the area of the 19 barangays in the mainland of Mactan and 1,022 ha. is the combined area of Olango Island, Pangan-an, the 2 Caubian islsets and Caohagan. Approximately 1,300 hectares of mainland Lapu-Lapu City is used for the airport, 1,067 hectares is used for the airbase and 199 hectares is now the PEZA (previously MEPZ). Recently, 100 hectares from the area of the airbase was developed into PEZA II. Based on a 1996 census, the city has a total population of 205,709. The barangay with the highest population is Gun-ob (in the mainland) with a population of 22,885, the lowest population is 342 in the islet of Caohagan. Made up entirely of hard coral rock. Actually 40% of the total area is of rocky terrain. Loam soil, if any is scarce. The place is characterized by beautiful beaches on one side of the island and deep harbors along the coast facing Cebu. There are 2 main types of climates - the first is characterized by a pronounced maximum rain period with no dry season, the second by a short pronounced rain period with a short dry season lasting from 3 to 4 months often occuring from March to May. The City is not located within the typhoon belt, hence typhoons seldom affect the place. A first-class city with an annual income of 400 millinon. The seat of government is in PUSOK along the Quezon National Highway, 200 meters form the Mactan-Mandaue Bridge. 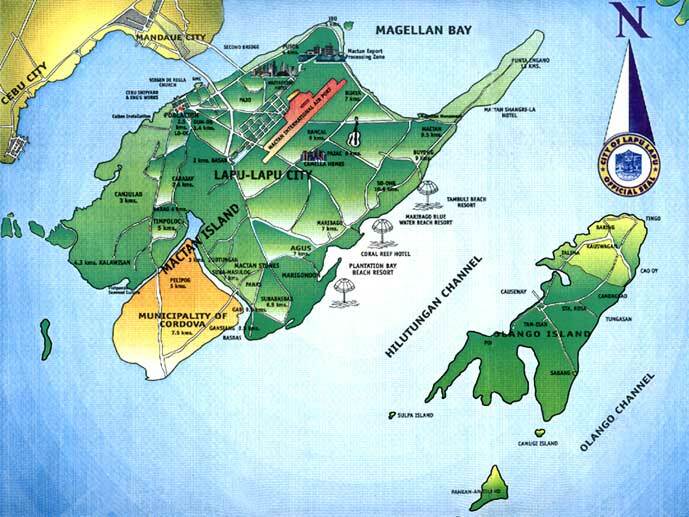 Mainland Lapu-Lapu City, including Olango Island is supplied with power by National Power Corporation through Mactan Electric Company. The main sources of potable water is from deep wells and from Metro Cebu Water District. Communication facilities are provided by PLDT.